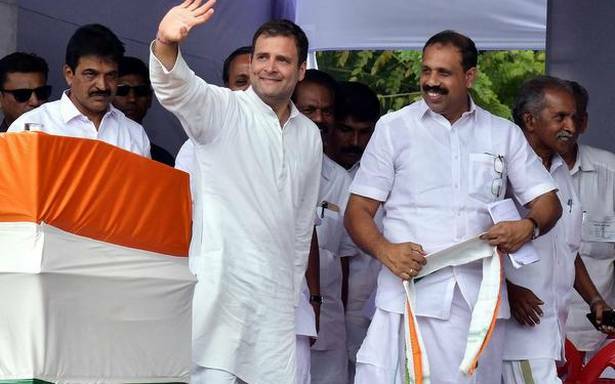 Congress president Rahul Gandhi, who is contesting from the Wayanad Lok Sabha seat, on Wednesday said it would be an honour for him to represent the voice of the people of Wayanad. He was addressing a massive rally at Sacred Heart School Ground at Thiruvambady in the district. “There is a particular reason for choosing Wayanad…You represent the spirit of Kerala, but you also represent India…Wayanad represents many different communities, many different religions and many different ideas. But mutual respect to all. You might believe something. But you always respect the beliefs of the other person,” Mr. Gandhi said. In his 35-minute speech, the Congress president reiterated that he chose to fight from North and South India as people in different parts of the country in the past five years had given a feeling that they were disturbed. “The disturbance comes because of the RSS and Mr. Narendra Modi trying to impose one idea, one vision, and one language on India,” he said. Striking a chord with the crowd, Mr. Gandhi said that he had come to Wayanad as “a son, brother and friend. And if I may say so, with all humility I am coming here to learn from you. I am here to understand and solve your problems,” he said. He said that Wayanad faced some serious challenges such as not having good healthcare facilities. Another was popularising the name of Wayanad. So that tourists from the U.K., the U.S. and Japan would come here. “Even ex-U.S. president Barak Obama would want to holiday in Wayanad,” he said. Amid applause, Mr. Gandhi said that he would take up the issue of man-animal conflict and also look into the demand of lifting the ban on night traffic through Bandipur Tiger Reserve. He added that if voted to power, the Congress would revive the Mahatma Gandhi National Rural Employment Guarantee Scheme as it had benefited thousands of people including Sreedhanya Suresh, the first tribal woman from Kerala to clear the All India Civil Services Exams.